Players take turns removing one block at a time from a tower constructed of 54 blocks. Each block removed is then placed on top of the tower, creating a progressively taller and more unstable structure. 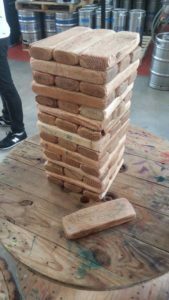 The name jenga is derived from kujenga, a Swahili word which means “to build”. 1/5th as thick as its length = 1/5x 10.5 = 2.1″. Oh well, 1.5″ will do. Cut 54 pieces of 2×4 into 10.5″ long pieces. An 8′ length of 2×4 will make 9 pieces. 54/9 = 6 ea 2×4’s.